I was one of the many people following this historic trek and had an interest in it as I was, at the time, compiling the career statistics for The Lord’s Taverners, one of the charities to benefit from this epic Himalayan expedition. I wanted the scorecard from this “Test” and it was duly passed on to me by one of the people mentioned in the book, the trophy presenter, Shona Langridge. It was only whilst reading the introduction to the book and the first chapter that Alan Curr struck me as a man after my own heart. A cricket tragic, a traveller, a travel agent with a sedentary job and a yearning for that feel for adventure – all of which I am and have - and, when the trip came off, I could easily relate to the headaches of collecting the monies which was Alan’s role. I had run two trips, made the travel arrangements, taken the monies and it had turned out well but our trips were to less lofty plains: Corfu and Malta. That too started in a pub after a rained off match so I can relate very well to it. I hope Alan sleeps more easily at night these days. By the time I finished the book, I realised that my responsibilites in Corfu and Malta were small fry. Oli Broom, whose cycling epic from the UK to Australia to watch The Ashes and playing cricket in twenty three countries also benefited The Lord’s Taverners, has written an interesting foreword and thanks the cricketers for part of his inspiration. Wisden editor, Laurence Booth, has also added a very erudite foreword and shows that his knowledge of mountaineering is almost as impressive as his cricket. What became quickly clear was the vast amount of organisation which such a trip entailed. Participants had to not only fork out a not insubstantial amount of money but also provide sponsorship of £1500 towards charities, do their own bit where possible towards the promotion of the event and become fit enough for the trek which, in one case, meant undertaking the well-known Three Peaks trek in the U.K as practice. With fifty people to be taken, not everything inevitably went to plan and the logistics in finding main sponsors can well be imagined. They did extremely well to get Qatar Airways to fly them to and from Nepal and, amongst others, The Lord’s Taverners for helping with the promotion. Radio interviews were arranged, photo shoots in London and, on the trip, ITN sent their own cameraman to send in daily bulletins. Trekking in Nepal demands obtaining permits and, whilst it seems there were many willing and keen to help, there were problems and bureaucratic issues. The two participating teams were called Team Hillary and Team Tenzing in deference to the first two conquerors of Everest, Sir Edmund Hillary and Sherpa Tenzing Norgay. There seemed to be many problems on the trip with sickness but it seems that everything was allowed for and organised well: medics were taken along and people were divided into groups on both the trek and on the flights. Friendships were tested but, on such an adventure as this, with a group of reasonably young, competitive and ambitious people, this was perhaps unsurprising. 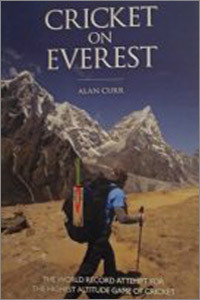 Alan’s book is also impressive for a short chapter on the history of Everest and the Himalayas. Having an interest in mountaineering and having read quite a number of books on the subject, I was delighted to find out a thing or two from Alan’s chapter which I had not previously known. He has the ability to set the scene very well and writes in great detail whilst also keeping the reader’s interest. I found it engrossing and should thank one of the dynamic duo whose idea the cricket match was, Gareth Wesley, for, as Alan writes “He was always on my case, as a wannabe journalist, to write articles and get the story out there, showing people I could string a sentence together, ...” String a sentence together, he most certainly can and this is a most impressive read. The match itself is naturally given an excellent write-up and I enjoyed reading it with the benefit of the scorecard kindly given to me by Shona Langridge. In a way, it is a slight shame that a scorecard does not appear but I can vouch that all the match facts are spot on! Playing cricket at such a height is as much about endurance as cricketing skill and both teams are to be congratulated even if tempers were at times frayed. It says much for the ambition of all involved in both squads that all were desperate to play and it cannot have been much fun for the captains having to leave out certain players. Commitment to the adventure as well as cricketing skill all played their part in selection. I am delighted to have been given the opportunity of reviewing Cricket on Everest. It may have encompassed many of my interests and hobbies – and made me not a little envious – but through the efforts of Richard Kirtley, Gareth Wesley, Alan Curr, all the players and the “trektators” as well as the supporting medics and people in Nepal, someone’s idea over a pint of beer has resulted in many charities benefiting and an awesome once-in-a-lifetime adventure to be played out. Cricket brings people together and has given us many wonderful and odd tales and this is one such which all involved in should be rightly proud. I hope that any cricketer, adventurer, traveller or armchair supporter will take the time to read about this remarkable adventure.